Radial tunnel syndrome is an uncommon nerve compression problem that causes pain in the forearm. 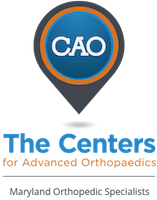 It is treated by Dr. Peter G. Fitzgibbons, MD at The Centers for Advanced Orthopedics: Maryland Orthopedic Specialists Division. Dr. Fitzgibbons performed fellowship-training in hand, wrist, and elbow surgery through the Harvard Hand & Upper Extremity Fellowship based at Brigham & Women’s Hospital in Boston. With locations in both Germantown and Bethesda, Maryland, he and a team of orthopaedists, hand therapists, and physical therapists offer a comprehensive range of services covering the diagnosis and treatment of radial tunnel. What exactly is radial tunnel syndrome? The radial tunnel is an area deep on the thumb side of the forearm where the radial nerve travels. While not entirely understood, it is thought that the nerve becomes compressed, causing a dull aching feeling without compromising the function of the nerve itself. Radial tunnel is difficult to diagnose in that there is no test or imaging study which can definitively detect it. This means that it is a “clinical” diagnosis, meaning it’s based on the history and physical exam alone. What is the natural history of radial tunnel syndrome? Radial tunnel seems to run its course and resolve on its own in the majority of patients. What is the treatment for radial tunnel syndrome? Initial treatment of radial tunnel syndrome is usually some basic exercises, modifying activities, and over-the-counter medications as needed for discomfort. Sometimes cortisone injections are used to try to relieve discomfort. In rare cases, a decompressive procedure can be done to take pressure off the nerve if symptoms are not resolving with conservative measures and time. What is the surgery like for radial tunnel syndrome?